In this Part we will explore the meaning of the Twelfth Shloka of Sri Vishnu Sahasranamam. He lives in all beings and thinks of his devotees as a treasure. He is an embodiment of truth and has a pure mind that is free from all bias. He is accepted by all Rishis and Upanishads as ‘Sat’ or ‘Truth’. He treats everyone equally and his blessings never go futile. He has beautiful eyes like the Lotus flower. All his actions are righteous and He is an embodiment of Dharma. He has assured that He will reincarnate millenium after millenium to uphold Dharma (Sambhavi Yuge Yuge). The Nama ‘Vasuh’ occurs three times in the Vishnu Sahasranamam and needless to say has at least three different meanings. Vasuh basically comes from the root word ‘vas’ meaning to live. The following meanings are indicated. a) One who dwells in the hearts of His devotees. 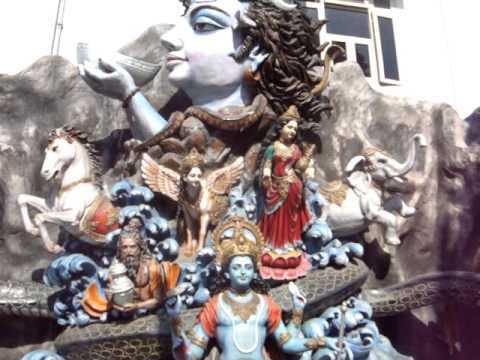 b) One who dwells in the Milky-Ocean also known as Ksheera Sagara. c) One who is the treasure that His devotees seek. e) One who lives in the sky. ‘Teshu ayam vasati iti vasuh’ – He is Vasuh because He resides in all beings (or resides in the heart of his devotees). Vasati iti Vasuh means One who dwells. He dwells in the hearts of His devotees who show even a small amount of devotion. “sa lokaanaam hitaarthaaya ksheerodhe vasati prabhuh” – The great Lord resides in the Milky Ocean or the Ksheera Sagara for doing good to His devotees in this world. “Esha Narayanah Srimaan kshIraarnava niketanah” – This Narayana is always with Lakshmi, and resides in the Milky Ocean. The word ‘Vasu’ also means Wealth – Vasati Neetimataam Griha iti Vasu. 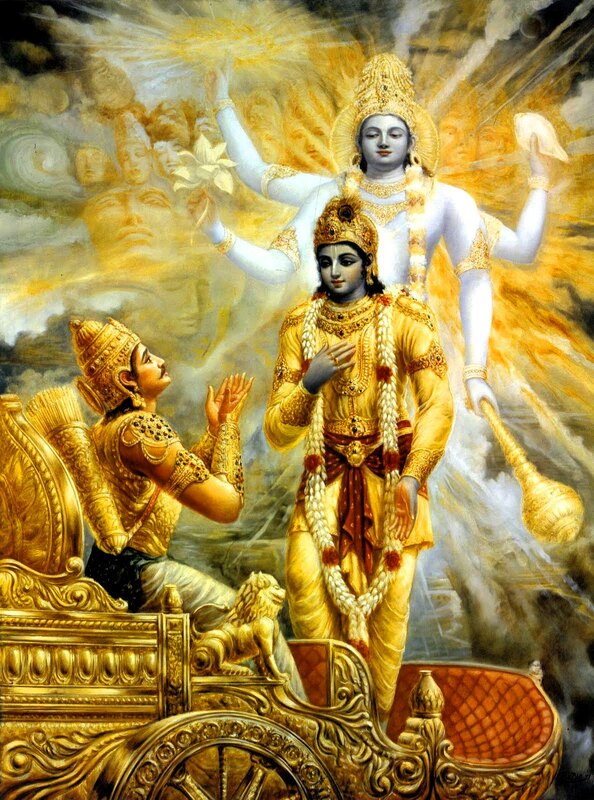 In the Bhagavad GIta, Chapter 7 Verse 19, the Lord says: Vasudevah Sarvam meaning Vasudeva is everything. He is the ultimate wealth that learned men seek i.e. Moksha. 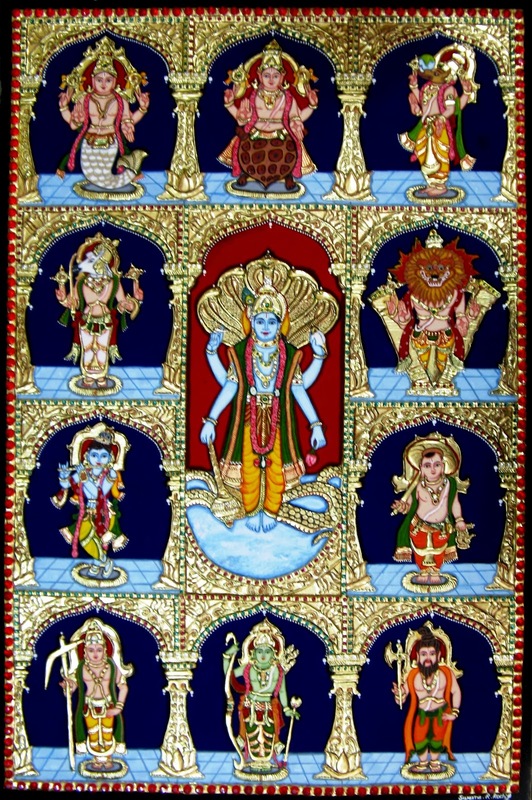 There are eight elemental gods (called “Ashta-vasu”, ‘Eight Vasus’) representing different aspects of nature and cosmic phenomenon. He is Vasuh because He is one of the eight Vasus . Sri Adi Sankara gives the following reference from the Bhagavad GIta (Chapter 10 Verse 23) to support this interpretation – ‘Vasunam Pavakascasmi’ – I am the Pavaka among the Vasus meaning He is the God of Fire. And by burning He purifies everything. Vasu also means One who as air, moves about and resides in the mid-region – Vasurantiksha Sat (Katho Upanishad 2.5.2). In the words of Sri Adi Sankara Vasumanah is explained as ‘Prashastam Manah Yasya Sah Vasumanaah – One who has a pure or rich mind’. Bhagavan’s mind being unpolluted by baser feelings such as passion, hatred, anger and infatuation. He has a mind which has none of the sins of passions and pain, none of the storms of desires and jealousies, none of the quirks of likes and dislikes. His mind is totally pure and so he is ‘Vasumanah’. This Nama can also be interpreted as someone whose mind considers his devotees as his treasure. In the Bhagavad Gita Chapter 7 verse 19 Lord Krishna says– Vasudevam Sarvam Iti Sa Mahatma Sudurlabhah – Knowing me to be the ultimate cause, such a great soul is very rare. “Krishna is rooted in Satya and Satya is rooted in Krishna. Existence and non-existence are grounded in Govinda. So great men opine that Krishna is Truth itself”. Sri Adi Sankara gives the following from the Aitreya Aranyaka in support of this – Sat means ‘with a form’ and Tya means ‘without a form’, hence Satyah refers to someone who is both manifested (Vyakta) and unmanifested (avyakta). One whose form is made up of Prana, matter and sun. ‘saditi prANAsteetyaNam yamityasAvAdityah’ – Sat means Prana, Ti means Food, and Yam means the Sun. 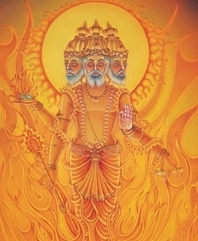 He is satya because His form is made up of Prana, matter and sun. ‘Satsu sadhutvaat Satyah’ – He is Satya because He is well-disposed towards the noble souls. Taitriya Upanishad defines him as ‘Satya Jnanam Anantam Bramha – He is Truth, Knowledge and Endless’. Swami ChinmayAnanda points out that in philosophy, Satya is that which is the same in all three periods (past, present, and future). He is the only one who fits this definition, and so He is Satya. Samaatma means ‘One who has an even mind’. As explained by Sri Adi Sankara ‘Sama Aatmaa mano yasya raagadveshaadibhih adooshitah sah samaatmaa – One whose mind is evenly balanced and unpolluted by greed or aversion’. The alternative interpretation is ‘Sarva Bhooteshu Sama Eva Atma’ – He treats everybody equal irrespective of who they are’. He does not distinguish one from another when it comes to His thoughts on His devotees. Since He is the soul in everything, He finds no distinction between them. He is unattached to anything and sees everything and everyone as equal. According to Sri Adi Sankara this Nama can be explained as Sammita or Asammita. The former is interpreted as ‘Sarvairapi Arthajaataih Paricchinnah Sammitah– He has been (inadequately) measured in various different ways’. The latter is ‘Sarvaih aparicchinnah amitah Asammitah – He is unlimited or immeasurable’. a) One who has let Himself to be understood and controlled by His devotees. b) He is the ultimate Truth that is accepted by the Rishis and revealed in the Upanishads. Both the meanings are based on the word ‘Sammata’ which means ‘accepted’. The first interpretation is by Sri Parasara Bhattar, who points out that this Nama signifies that He willingly accepted the role of being ‘controlled’ by Kausalya, Yasoda, Dasaratha etc. He chose the parents to whom He was going to be born, and then ‘played’ the role of a child willingly. Swami ChinmayAnanda points out that ‘Sammitah’ can mean that He is the only one who is the accepted Truth or Sammata by the Rishis and the Upanishads. Samah means One who treats all His devotees equally. Samah means the same person at all times, ‘Sarva kaaleshu Sarvavikaara rahitatvaat’. In the Bhagavad GIta, chapter 9 verse 29, Krishna says ‘SamO’ham sarva bhuteshu’ meaning I am equally disposed towards all beings. Sri Adi Sankara interprets the meaning as One who is the same at all times. He also gives another interpretation – He is (sa) with (Maya) lakshmi always, and therefore He is Sama. ‘Mayaa Lakshmya Saha Vartate iti Samah – Someone who lives with Lakshmi Devi’. Amoghah means One who always gives fruits to those who worship Him. “O Rama! A sight of You is never futile. The praise of You is also never futile. Those who are endowed with devotion to You, will always be successful in their life”. Sri Adi Sankara explains this as ‘Poojitah Stutah Samsrutah Vaa Sarvaphalam Dadaati Na Vrithaa Karoti iti Amoghah – Whether worshipped or praised or just remembered with true devotion, He gives desired fruits, does not allow it to go futile hence He is called Amoghah’. Amoghah can also mean ‘Satya Sankalpah – all his plans will successfully materialise’. Pundarikam means lotus flower – ‘Pundarike iva akshini yasya sah’. Pundarikakshah means One whose eyes are beautiful like the Lotus flower. A second interpretation of this is One who pervades the hearts of everyone and observes everything – ‘PundarIkam hrtkamalam akshatIti va’. Koorathazhwan was born as Kuresan in a small hamlet ‘Kooram’ near Kanchipuram, in the year of 1009 A.D, in an affluent family. Koorathazhwan was married at a young age to Andalamma, a devoted and pious lady. Both of them were deeply devoted to Lord Varadaraja Perumal in Kacheepuram and were famous for their unstinting philanthropy and kindness. Later on they moved to Srirangam where Kuresan approached Swami Ramanuja and became his disciple. Soon Koorathazhwan became one of the principal disciples of Swami Ramanuja and assisted him with compilation of Sri Bashyam. He travelled with Sri Ramanuja to Kashmir for the Bodhayana’s notes to complete Bhashya on Vyasa’s Brahmasutras. And when they were not allowed to take copies or notes, he memorised all of them and reproduced it! Once he even corrected his Guru Sri Ramanuja in one of his interpretations, thus earning the love of Sri Ramanuja for his knowledge and courage. At that time, the then Chola king was influenced by certain groups and he ordered Sri Ramanuja to be brought to his court. Coming to know this, Koorathazhwan immediately rushed to the mutt in Srirangam and requested Sri Ramanuja to move to a safer place. Upon the insistence of Koorathazhwan, Sri Ramanuja and several other disciples moved to Melkote. 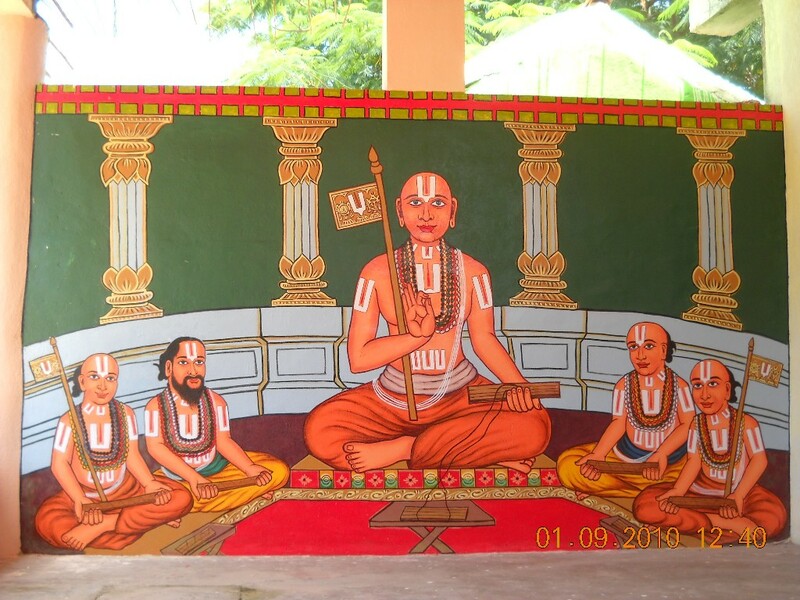 When the soldiers came to the mutt, Koorathazhwan was dressed up as Sri Ramanuja. Mistaking him to be Sri Ramanuja they took him along with Sri Mahapurna to the royal court in Cholapuram. At the court the King wanted them to sign a written declaration that read: “Siva was Supreme and no power existed above him”. But both of them refused and argued the supremacy of Lord Vishnu, citing from the Vedas, Upanishads and various other scriptures. The King got furious and ordered their eyes to be gorged out. On hearing the statement, Kuresan grabbed the quill from the King’s hands and said, “Let me save you the trouble, you tyrant, for I shall pluck out my eyes by my own hands! These eyes that have set its sight on a sinner such as you, have no further use for me!” Kuresan plunged the sharp writing quill into his own eyes, threw his eyes on the floor at the King’s feet! Ramanujasya charanow sharanam prapadye !”. 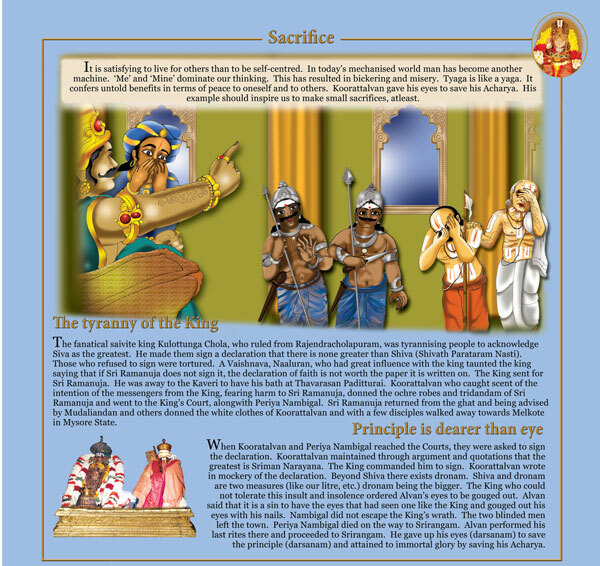 While the King was shocked by the action of Koorathazhwan, he went ahead and ordered his soldiers to gorge out the eyes of Mahapurna as well. Later, both began to make their way back to Srirangam but Sri Mahapurna lost his life on the way. 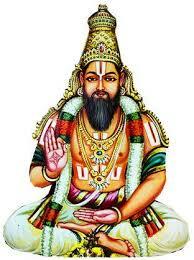 Later on, the blind Koorathazhwan moved to a town near Madurai. The Chola King died and his son succeeded him. He was a wise king and he allowed freedom of faith and worship amongst all his subjects. After living in exile for over a decade in Melkote, Swami Ramanuja returned to SriRangam. Hearing the news of his Guru Ramanuja’s planned return to SriRangam, Koorathazhwan hastily returned to Srirangam and awaited his Guru’s arrival. As Ramanuja reached Koorathazhwan’s house, he tottered forward and fell at Ramanuja’s feet and clasped them tightly to his eyeless scarred face. Ramanuja was speechless and tears rolled down his cheeks. “My child, my child,” whispered Ramanuja to Kuresan, “What have you done! 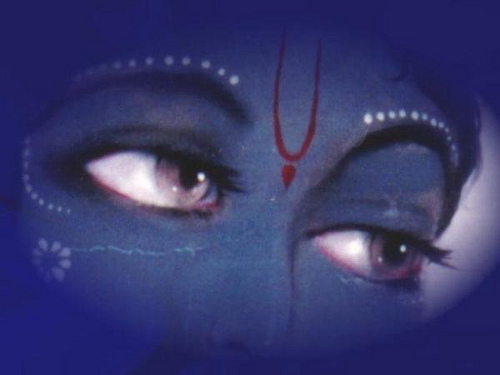 You have given your eye… the eye of faith… for the sake of Our faith in Lord Narayana!”. 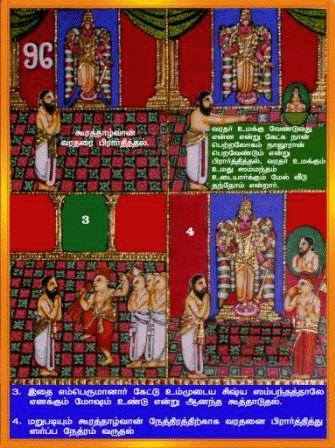 Ramanuja then asked Koorathazhvan to pray to Kancheepuram’s Varadaraja Perumal for the restoration of his eyes. Koorathazhwan said, “I have no desire to see anyone except my Guru and the Lord. The Lord restored him with special sight thus fulfilling his desire. “Sir, in the Pasuram “mudiyudai” it is said that our elders in heaven who preceded us, come out of the gates of “Parama-Padam” to welcome their younger ones when it is the latter’s turn to arrive there…. and then usher the young ones into God’s Presence. Sir, but I consider this to be an improper order! It is the younger ones who should always go first and prepare in Heaven to receive and welcome their elders. That is the order of precedence I wish to preserve! Swami Ramanuja could not contain his tears and embraced Kuresa. Thus Kuresa achieved salvation not only for himself but also for his Guru and others. The Lord always showers his grace on his devotees with his merciful eyes, His Divya Kataksham. Vrisha means Dharma or Virtue – Abhilashitam Varshateeti Vrishah. Bhagavan is called Vrishakarma because all his actions are according to Dharma. Once Sage Durvasa had given a garland to Indra, the King of Gods. Indra placed the garland around his elephant, but the animal trampled it, and the sage felt insulted. He cursed the Devas to lose their immortality, strength, and divine powers. After losing their kingdom, they approached Lord Vishnu seeking his help. Lord Vishnu suggested that the Devas pour medicinal herbs into the ocean of milk, and use Mount Mandara as a churning stick to get the elixir of immortality. However, the gods could not uproot the mountain. Thus, Vishnu advised them to make a pact with their enemies, the Asuras, so that both parties can share the nectar. This caused much apprehension among the Devas—however, Vishnu simply smiled reassuring them. 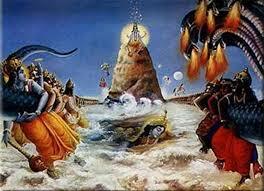 The Devas and Asuras eventually made their pact and together they uprooted Mt. Mandara and used it as a churning stick, wrapping the Serpent Vasuki around it as the churning rope. Vishnu instructed the Devas to take the head end of the snake while the Asuras were asked to take the tail end. The Asuras insisted that they should control the head end. 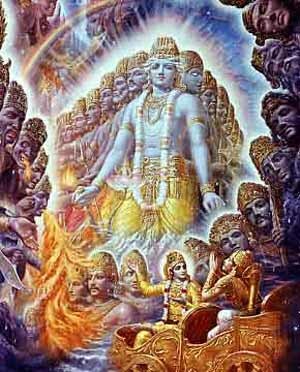 However, this was a reverse psychology played by Vishnu, for when the churning began, the Asuras were promptly weakened by the poisonous breath that emanated from the mouth of the Serpent. Finally, Mount Mandara churned, but the force was so great the mountain began to sink into the ocean of milk. Taking the form of the turtle Kurma, Vishnu bore the mountain on his back as they churned the waters. As the churning progressed, Halahala or the poison appeared first. Lord Shiva drank the Halahala, or the poison that churned up from the Samudra Manthan, to eliminate its destructive capacity. Shocked by his act, Goddess Parvati held his neck and hence managed to stop the poison from spreading beyond his neck. 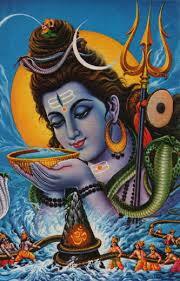 However, the poison was so potent that it changed the colour of his neck to blue, earning him the name Neelkanth. The Asuras immediately took the nectar, and quarrelled among themselves. 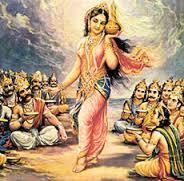 Vishnu then manifested himself as the beautiful Mohini and tricked the Asuras to retrieve the potion, which he then distributed to the Devas. By the time the Asuras realised the trick it was too late— the Devas had regained their powers, and were then able to defeat their foes. Thus the Lord restores Dharma through his righteous actions. The word ‘Vrisha’ means Dharma and Akriti means form. Hence, His form itself is Dharma or He is an embodiment of Dharma. Lord Rama is considered as the model of Dharma. In the Ramayana’s Yuddha Kanda, Lakshmana was engaged in a battle with Indrajit, the son of Ravana. All his arrows make no impression on his enemy. At last, Lakshmana aims an arrow at Indrajit with the Shloka-‘Dharmatma Satyasandhascha Ramo Daasharathir yadi, Paureshat Pratidvandvam Sharainam Jahi ravanim – Oh arrow! 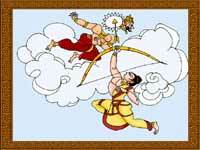 If it is true that Rama is a figure of Dharma and truth, kill Indrajit’. On the invocation of this oath, Indrajit could not escape and the arrow beheaded him, thus establishing that Rama was synonymous with Dharma. Bhagavan says that He does his actions according to Dharma and He has nothing to gain or lose by any action – Naanavaaptam avaaptavyam varta eva ca karmani – Bhagavad Gita Chapter 3 Verse 22. ‘dharma samsthApanArthAya sambhavAmi yuge yuge’ meaning I will incarnate for the sake of preserving Dharma, millennium after millennium. And true to his promise, He has taken nine avatars to restore Dharma. He dwells in all beings and hence He is Vasuh. He has a pure mind and so He is Vasumanah. He is Satyah as He is an embodiment of truth. He is free from all bias and a Samaatma with a pure mind. He is Sammitah as He is accepted by all Rishis and Upanishads as the ‘Ultimate Truth’. He is equally disposed to all beings and so He is Samah. He is Amoghah as His blessings never go futile. He is Pundarikashah with His Lotus like eyes. He is Vrishakarma as all his actions are righteous and in accordance with Dharma. He is Vrishakritih as has assured that he will reincarnate millennium after millennium to uphold Dharma. Divine narration. Thank you both for your selfless attitude in making such a wonderful & simple commentary with audio & video for people to connect & feel the vibration. The story of Kuresha is mindblowing. What a blissful narration. I am feeling very blessed to read this. Viewed your youtube link too. Absolutely divine.Thank you Mr.Sridhar & Mr.Shri Balaji for spreading the faith. Thank you very much Mr. Sridhar & Mr. Shri Balaji for this divine journey. God bless you both with immense happiness. Thanq both for such a beautiful narration. The story on Koorathazhwan is very very touching… Such devotion for a Guru is extraordinary & unparalleled. We are indeed blessed to get to read such amazing & factual stories of the Lord from your blog. Thnx once agn. Thanks Sridhar and Balaji. May your strenuous efforts at guiding the less initiated continue to benefit all of us. Thanks for your comments. Both Sridhar and myself are striving to paint the basic underlying unity of Hinduism which you have also pointed out. However where Shankara and Bhattar give different interpretations for the same name we describe both the perspectives (“Anubhavas”). We keep in mind ‘Om namo Bhagavate Rudraaya Vishnave Mrutyur Me Paahi’ as well as ‘Rudro Bahushiraa Babhruh Vishvayonish Shuchishravaah’ and ‘Sarvash Sharvash Shivas Sthanur Bhootaadir Nidhiravyayah’! 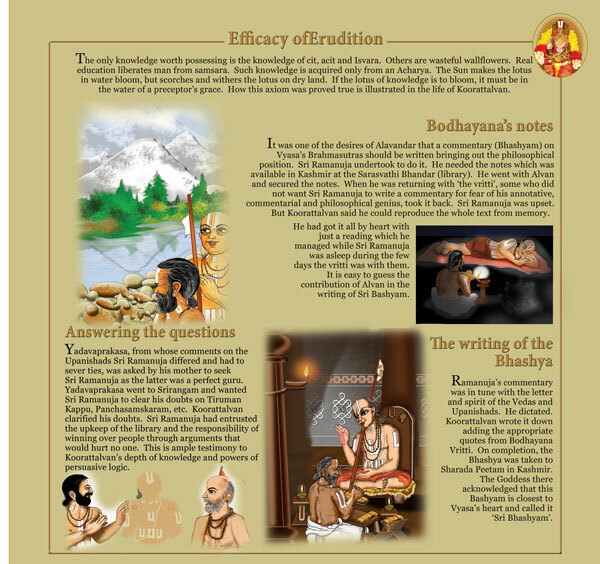 The episode of Koorathalwan and the ill-treatment afforded by the sectarian Chola king has been afforded a great explanation by the sage of Kanchi, HH Chandrasekarendra Saraswati Swami. In being forced to recite ‘Sivaat Para dharam Nasti’, he says that in the true catholic traditions of a Sri Vaishnava (read Narasim Mehta’s Vaishnava Janato’), he imagined the Great Lord Shiva in his mind, and visualised that the head is adorned with Drona Pushpam (thumbai in Tamil). He therefore said:”Asti Drona Atah Param”, implying how could you say nothing is higher than Siva? There is the effulgent drona flowers on his head? The tendency of sectarianism had infested Tamilnadu more than others, and as a societal counter-force, contributed to the equally abhorrent antipathy of some towards Lord Siva. The dharma is poorer for it. The indivisible Parabrahman can be approached through love and dedication. Hatred has no part in it, including for those who are atheists and agnostics. Our Lord is their parent, too.